This is definitely one of my favourites of the year so far - even though it's aimed at a slightly younger age than most of the books I review here. 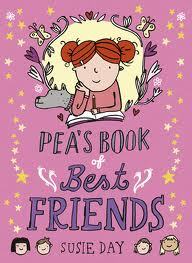 As well as these fabulous characters, there’s a sweet plot, a lovely message about making friends which is never hammered home too obviously, and a warm, engaging writing style which hooks you in straight away. It’s also wonderfully unpredictable, even the parts which seem straightforward at first – a bestselling author basing her three characters on her three daughters is fairly common in children’s fiction, but one of those characters turning evil and getting killed off must be much rarer! In addition, it’s one of the funniest books I’ve read for ages – I was struggling to contain my laughter virtually every time Tinkerbell said or did anything, while ex-merminate should win the Word of the Year award. And if, by some oversight, there isn’t a Word of the Year award, someone should set one up just to give it to ex-merminate. Absolutely huge recommendation as one of the best books I’ve read all year and a definite modern classic in the making. I can’t wait for book two!